Clone Clutch Cable for the YX140cc motor. Mounts into the YX140 (TB278) and will work with our controller (TB026LH). It will be too short if you use any of the other perches that we have on our website. 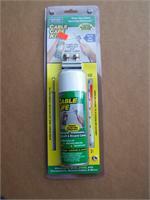 Cable Life Minus 70° is a general purpose and cable lubricant. 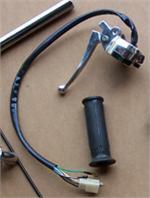 Also for carbs, ignition locks and steering mechanisms. Lubricates & rust-proofs w/ a nondrying film Kit includes luber tool, lubricant & special fitting for lubricating cables. Replacement Left controller for the reproductions bikes. The controller can be used on the classic bikes with modifications. Controls Include: Horn, Choke, Hi Lo Beam, and Blinkers and a choke button. Please see full website for cable recommendations. YX 140cc Engine, w/KickStart, Clutch 4 speed (N1234) 12v There is a lighting coil in this engine and will come with the following parts: Intake manifold, gasket, bolts, spark plug, gear shift lever, kick start lever, carburetor,CDI. See full web for more.